Ofelia Montelongo, a former student editor-in-chief from Superstition Review, will be hosting the closing event for the Creative Writing in Spanish Workshop at the Palabras Bilingual Bookstore (1738 E McDowell Rd, Phoenix, Arizona 85006). The event will take place this Friday, December 1st from 7pm to 9pm. The students of the workshop will be sharing the stories they wrote during the six-week course/workshop, thanks to the support of the Arizona Commission on the Arts. If you’re driving, remember that the library’s parking lot is behind the bookstore. For more information, check out the event’s Facebook page. This Friday our former student editor-in-chief, Ofelia Montelongo will be hosting the final Spanish creative writing class and workshop at Las Palabras book store. Ofelia created the group over the summer and this is the students’ chance to read the work that they have been working on. Las Palabras libraria is located at 1738 E Mcdowell and the reading starts at 7 PM. Click here for the Facebook event and more information. Guest Post, Fernando Perez: Who Am I (What’s My Name)? On the very first day of TA training, back in 2007, we were asked to think about how we were going to introduce ourselves to our students. They asked us to consider teacher identity in the classroom. Things like where we sat, what we wore and what we called ourselves were tossed around the discussion. Were we going to make them call us mister, miss, professor, or by our first names? I had a bigger problem. Since the very first day I entered school as a young boy, my name took on another sound. Fur-nan-doe Pur-rez fell from the lips of all of my teachers and classmates. My identity split. I was no longer just Fernando Pérez, as my parents pronounced it. It was at this point that my curiosity with the power of language grew. At home my name was always pronounced in Spanish. My folks and relatives said it correctly, but all of the new people in my life made me think that Spanish held only a place for intimates in the homes of cousins and grandparents. It’s not that my relatives could only speak Spanish. In fact, we are quite assimilated. Most of us have actually held on to the language and culture of our Mexican roots while integrating successful American practices, careers, and attitudes. I, however, internalized the split as the following: English belonged at school, among friends, and in the classroom; Spanish belonged at home. Whenever Spanish crossed into the English boundary that had been set, I would become nervous or embarrassed. I even began pronouncing my own name in English. The struggle with identity increased as I encountered far more Latino students in high school than I had ever had in my elementary and junior high where I was among only three. Fast-forward to graduate school and TA training. My first semester at Arizona State University, I had a Poetry class with Professor and renowned poet, Alberto Ríos. I remember the first day he took roll. When he got to my name my face flushed with blood. He said my name in Spanish. The line had been crossed. This was the first time any teacher had ever said my name the way my mother does. What’s more, I felt the guilt that I associated with the times my mother said my last name—usually reserved for moments of scolding. I remember asking my professor after class if he was embarrassed bringing Spanish into an “English” class. His answer has stayed with me to this day. It was something along the lines of saying, “We are in the Southwest, and what’s more, we are in a place of higher learning, where language and culture is not limited to those whose primary language is English.” He continued to say that Spanish and any other language should be attempted by those who cannot speak it—at the very least a word or two here and there as a way of building bridges. From that moment on I felt empowered, yet I still accommodated my English language students by providing them the option of pronouncing my name in English, the way I had been used to hearing for half of my life. I felt content having at least provided the Spanish option as recognition for those students who knew my struggle. Today, I don’t provide the English option. Instead, I say my name in Spanish, provide Ped-diss as a way of sounding it, or tell my students that they can call me “Mr. P.” Introductions are important. Identity is important. I share the history and struggle of reconnecting with my name on the very first day of every class. Seeing myself as belonging in this place of higher learning has been a struggle. I know that several students feel the same way. It is not surprising that students both at Arizona State University and now here at Bellevue College have come up to me after class and told me how much they can identify with the struggle of holding two different languages in their heads and how they have also struggled with the split in identity. It is with identity and my name in mind that I had to speak up when my business cards here at Bellevue College were printed and my last name was misspelled. I was not insulted or even slightly stirred; I just knew that it would be important for me to ask that they be reprinted. I thought about how my cousin Carlos used to tease me when we were children, asking me, “I bet you don’t even know where the accent mark goes in your last name. From that day forward, you better believe I learned it. It was important then for me to set an example for my Latino students that our names should be pronounced and spelled correctly, that they can be points of pride, and that the sounds they create are welcomed on this campus. It was an easy mistake for whoever printed the business cards to make. I don’t consider it a micro-aggression in any way. How can anyone know how important a little accent mark is? In the end, what mattered was in the way my request to fix the problem was handled. No one raised an eyebrow, no one sucked their teeth, or rolled their eyes. The cards were changed and that was that. This was very reassuring to me as teacher of color at this school. All aside, I find that my mere presence before these students of color is important. Teaching is a humbling vocation for me, but my face and my name are important for students to see, especially in an English class. I do find that my students of color, my Latino students especially, are eager to speak up and share their thoughts in class. They are eager to come up and establish a relationship with me after class as well. They want to tell me their stories and they want to know how I am adjusting to the weather and culture here. This is not to the exclusion of my white students. Because I care about education and learning, because I am excited about nerdy things, or articulate well, I find—understanding that I am making a sweeping generalization—my white students are eager to invest in me as well. They are curious about me at the very least, and I am certainly eager to invest and to be a bridge to all my students. 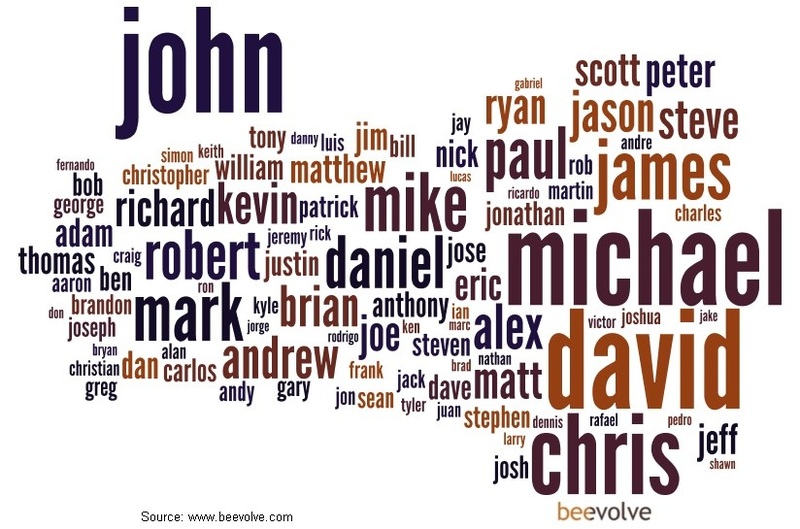 Whenever I take roll, I read my students’ last names and ask them to tell me how they would like to be identified. This is an important way of empowering my students and honoring pluralism. How they identify themselves within the context of race, gender, or sexual orientation matters. I will be honest, it used to upset me inside that some of my students had “American” names they would ask to be called by—as a way, I thought, of accommodating English speakers. I used to want those students to accept their “foreign” names and allow me the room to learn how they were pronounced. When I think about it, I can only offer my anecdote about my name and the struggle I faced with identity as a model for my students. If they are not worried about it or if they are not ready to address that within their own lives, it is not up to me to push. Honoring their choice to be called what they ask to be called has been my pact. One student last quarter shocked me then, when she asked me to call her “Skunk.” Had she not been in my Creative Writing Poetry class, I might have found it difficult or odd, but I honored her request because she seemed sincere. As I got to know her through her writing and our conversations, I learned that she too was struggling with identity in her own way. Skunk identified culturally as Persian. If that weren’t complex enough, she felt the burden of feeling out of place in a White-dominant society. She could have passed for being “white” but she didn’t identify that way. She would say things like, her parents don’t like her speaking Farsi in public or that they don’t want her to date anyone whose culture comes from the Middle East. Her own family and the dominant culture at large placed Skunk in the middle of complexity and confusion. Sometimes her confusion was self-imposed, but whatever the case, it was real and felt. I worked with Skunk, nudging her to drop a line or two of Farsi into her poems. I told all my students that other languages or modes of speech were priceless nuggets in poetry. I think, if properly placed, other languages and modes of speech add a tremendous amount of flavor to any writing. Over the course of the quarter I noticed subtle changes in Skunk’s behavior. Her confidence improved. This quarter she is registered in my ENGL 101 class and when I took roll on the very first day, she wasn’t embarrassed when I came across her last name—something she quickly discouraged me from saying in our Poetry Class. Skunk now goes by her given first name. English Language Learners populate my classrooms as well. One such student in the fall quarter was Zaw. He was a quiet guy, rarely offering his thoughts during class discussion. I would carefully nudge him every now and then and one day after class he approached me. Zaw informed me some students feel uncomfortable speaking their minds because that is not how they are culturally used to doing things. He asked that I bear with him as he adjusted to my request to share his thoughts. I was happy that he felt comfortable sharing this with me. Zaw also told me that he felt stupid because he had an accent and because his English was limited. I quickly informed him that my pedagogy favors clarity of thought over mechanics and the use of “big” words. I told him that if it made him feel more comfortable he should consider writing out his ideas in his native language first and then work toward translating his ideas into English. I wanted him to know that his intelligence was not going to be measured by how well he spoke English. Zaw’s attitude and confidence improved from that point on and he was further supported after we read and discussed “Mother Tongue” by Amy Tan in class. I want my students to feel like they can come to me for anything. I don’t pretend to know everything, but I inform them that we can work through their issues with writing or life outside of class, and that I will help them to find additional resources if necessary. Some students recognize and utilize my accessibility and support right away. For a variety of reasons, others do not. Being so far away from my own forms of support/community has, at times, made the days seem very long. My family and friends are integral to my being. Transitioning into the new culture here at Bellevue College, the culture of the department, the quarter system, the Pacific Northwest (my apartment, the climate, the people), and all without my partner and while dealing with the recent loss of my grandmother, have shaken the ground I stand on. Remembering my identity, who I am and where I have come from in the midst of these challenges, has helped me to grow as an individual and as a teacher. My identity is constantly being forged. I am working on the relationship I have with myself so that I may also improve the relationship that I have with others. I am learning to quiet the voices that say that I don’t belong here and that I don’t deserve this position or that I do not have anything to contribute to the department or the college. I am becoming more deeply rooted in the belief that students have the right to their own languages and that I am not a gatekeeper toward the “next level” of the English language or writing. I want to encourage students to fall in love with writing the way I did. I want them to enjoy their time in all of their writing class, whether they are required courses or not. I do not believe that a student’s writing will be transformed over the course of one short quarter, but I do believe that their relationship to the subject and desire to continue on this path can be fostered in my classroom. Ultimately, I have come to accept that students respond to my style of teaching, my accessibility, and who and how I am as a person. When students invest in me, they begin quickly to invest in the class. When I was an undergrad I made similar investments. I knew I wanted to be a teacher when I sat as a student in Dr. Velvet Pearson’s Intro to Poetry Workshop at Long Beach City College. I liked how we sat in a circle and each weighed-in on a poem. Everyone, from their own corner of the world, with a fresh and different take, offering their perspectives on issues that affect us as human beings made me realize how valuable this act can be. It made realize that we learn from each other, not just the teacher, that our voices matter, and that we need these human stories. Dr. Pearson was the first English teacher that treated me like I was someone who was smart and that made me feel like my contributions were valid. She got me excited about writing, which made me invest in the journey that lay ahead of me as a writer. That is, at least, what I took away from her class and what I hold as an integral part of my pedagogy as an instructor today. 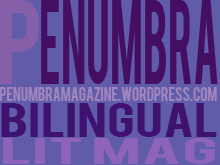 Penumbra, the bilingual literary magazine based out of Madrid, Spain, is preparing to release its second issue in late May, 2013. The magazine was founded in the summer of 2012 at Saint Louis University-Madrid with the goal of creating a space for contemporary writers in English and Spanish between the same covers, to bridge the gap between the English and Spanish-speaking communities both in Madrid and in the Americas. The magazine operates on a shoestring budget, and is run by a band of hardworking, underpaid word lovers, including a handful of graduate students in English Literature. Recent fundraising reading events have taken place at a private apartment on the west-edge Paseo del Pintor Rosales, and at The Toast Cafe in Madrid. At these events, a combination of local and U.S.-based musicians performed in English and Spanish following readings of poetry, fiction, and creative nonfiction. The first issue of Penumbra featured work from 44 writers and artists from around the globe; check the magazine’s blog for updates on the forthcoming issue. As of now, all content is available for free online or for sale in print. Penumbra also maintains a daily-updated Facebook feed, where fellow word gluttons are welcome to read, comment on posts, and interact with editors. Despite the magazine’s international pedigree, the editors look only for quality when evaluating submissions—rather than actively seeking work with a multinational tinge, they hope to publish the best of what comes in, regardless of all other considerations. To keep up with the magazine’s news, read submission guidelines, and enjoy the first online issue of Penumbra, click here. Visit the Facebook page here. Samantha Vélez is a senior at ASU majoring in Interdisciplinary Studies with concentrations in Spanish and Literature, Writing, and Film. She also has a minor in film production and will be graduating in May. She is currently working on her senior thesis with the Barrett Honors College about faerie folklore within adolescent literature. She is also a contributing writer for the website The Celebrity Café, and hopes to work in publishing after graduation. This is her first semester working with Superstition Review. 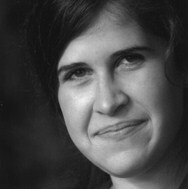 Samantha shares some of her literary inspirations in the following link. Reading Series Editor Samantha Novak is a sophomore at Arizona State University majoring in Global Studies and minoring in Spanish and Urban Planning. Superstition Review: How did you hear about or get involved with Superstition Review? Samantha Novak: I actually came to the Review by a slightly unconventional route. I am not an English major, but I heard about Superstition Review from my Honors English 102 teacher. She proposed it as a really neat opportunity and said that any of us interested should apply. I did, and here I am! SN: I think my favorite section of SR is probably the art section, I have always found photography incredibly powerful and enjoy having the opportunity to be exposed to new and different artists. SR: Who is your dream contributor to the journal? SN: My dream contributor would probably be Ruth Reichl. She has written some extremely powerful stories about her relationship with her family and with food (Reichl was a New York Times food critic and the editor-in-chief of Gourmet). I can really relate to this relationship since I also love food so much. SN: I really enjoy the job I am working at right now, but if I was doing something else I think I would like to try out being the blogger. It would force me to be more methodical with my blogging, which I think would bleed over to increased blogging in my other blogs. SN: I am really excited to be able to experience new artists and writers. I am always looking for new work to read. SN: I fell in love with The Enchanted Forest Chronicles by Patricia C. Wrede. The novels feature a really strong, feisty princess protagonist that would rather swordfight than do embroidery. When her parents try to set her up in an arranged marriage she runs away to be a dragon’s princess. Magic, dragons, pretty dresses, sly references and humor–what’s not to love? I brought the books with me to college and still read them when I’m feeling down. SN: I am bout to start The Girl with the Dragon Tattoo by Steig Larsson. SN: I love mentalfloss.com, cakewrecks.com, Facebook and various food blogs. SR: Do you create art? Tell us about a project you’re working on. SN: I do photography, and I am currently in the post processing stage of some photographs I took this summer when I spent a month in China.